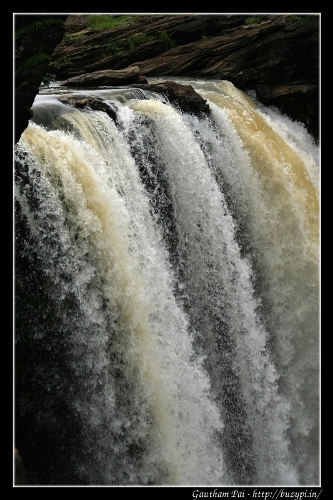 We then headed towards Jog Falls. Here again, you see vast amounts of plain, green lands stretching all the way to the hills. There was heavy breeze on the way and it was a pleasant experience. Every few meters, you see teenage boys selling pineapples. Pineapples sell for Rs. 10/- a piece for the medium sized ones, and Rs. 5/- a piece for the smaller ones. If you want, they can even peel it and you can have it there, or you can carry it with you. The guy from who we bought the fruit told us that they do this only two days a week and each one ends up selling hundreds. 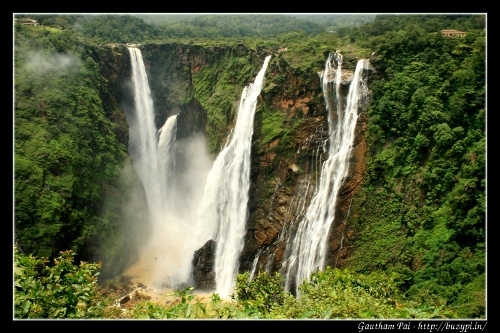 We reached Jog Falls around 1pm. 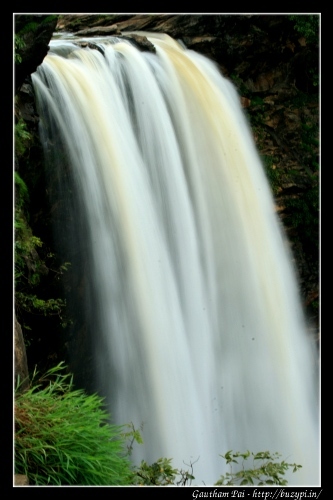 This is usually not a good time to reach a waterfall, because it will make long exposure photography tough. However, the light was low, and we could take a few good snaps. 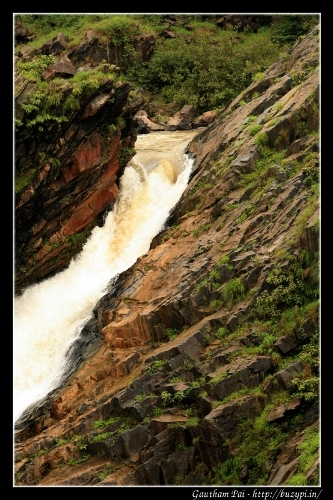 There are 2 approach routes – one of them, where you can see all the streams of the fall (Raja, Roarer, Rocket and Rani) in one view, while the other is near the guest house where you reach the top of the Raja falls. This part is more dangerous and you need to exercise caution. There was less water than expected, but in a way this is good, because otherwise there will be lot of droplets in the air, and you can hardly see the beauty of the falls. 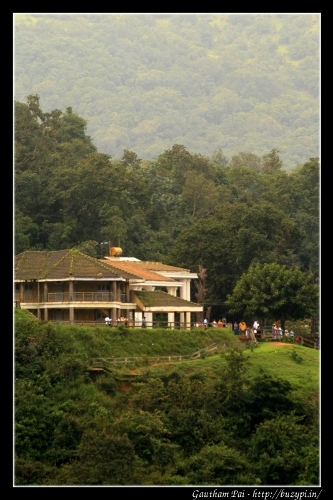 After satisfying ourselves with enough snaps, we headed back to Sagar. We had lunch in a hotel, and enquired about the possible places to visit. Of the possible places that we could visit: Ikkeri, Sigandur, Varadamoola, we decided to visit Ikkeri and Varadamoola that day. 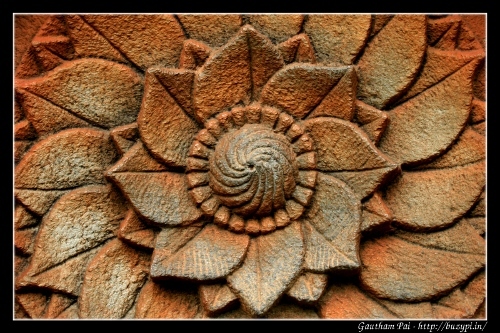 Sigandur requires more time and we plan to visit it in a subsequent trip. In addition to the directions, the hotel manager also asked us to visit Varadahalli. In Varadahalli is the Samadhi of Sridhara swamiji and this place is supposed to be very powerful. 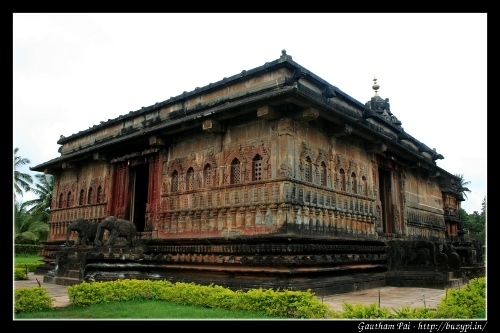 Our next stop was at Aghoreshwara temple, in Ikkeri. 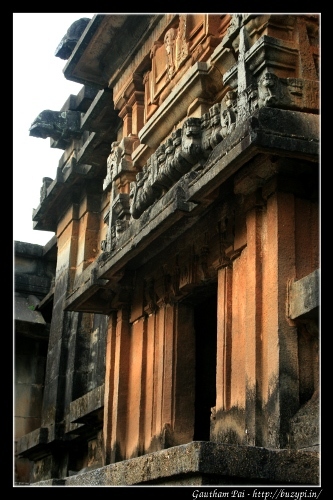 The temple was built with granite and dates back to the 16th century. Like any stone temple, the interiors are cool at any time of the day. 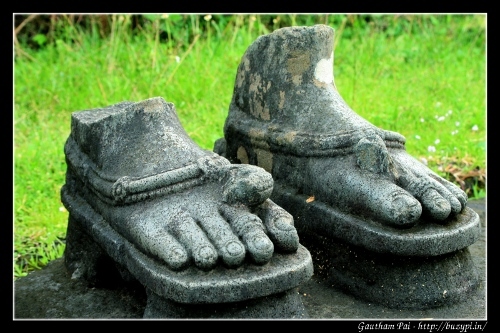 The temple has a Aghoreshwara statue (Lord Shiva). 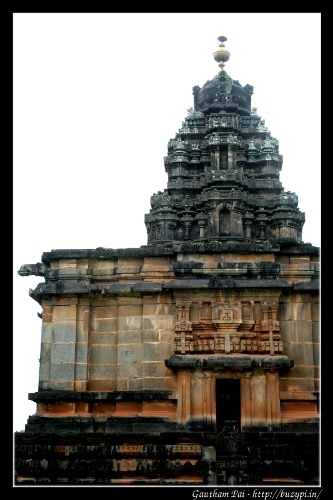 In front of the temple is a Nandi statue and on the right is Parvathi temple. In the front, you see a couple of broken feet. This one, supposedly belongs to a 30ft statue of Choudeshwari Devi. We then went to Varadamoola. 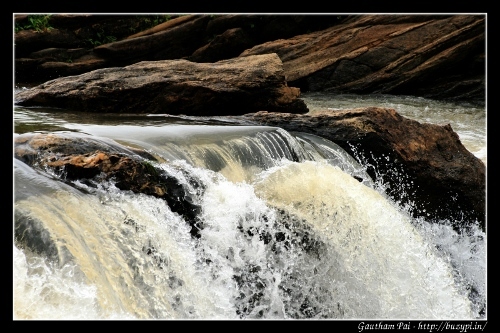 Varadamoola is the birth place of the Varada river. Moola in Kannada means “origin”. We enquired with the priest about the origin. 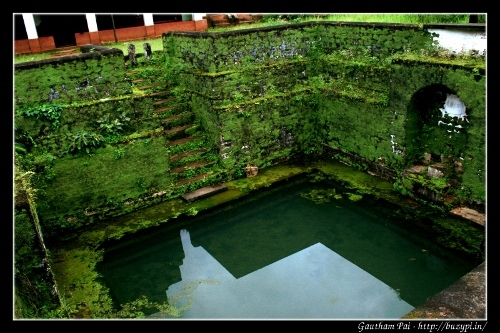 He said that the origin is in the foot of the statue of the Devi in the temple, it then flows into a pool outside, which subsequently flows into an even bigger pool. After introducing ourselves, we were advised (for a second time in the day) to visit Varadahalli. It was already 6:45pm and was almost dark. But we decided to go anyway. 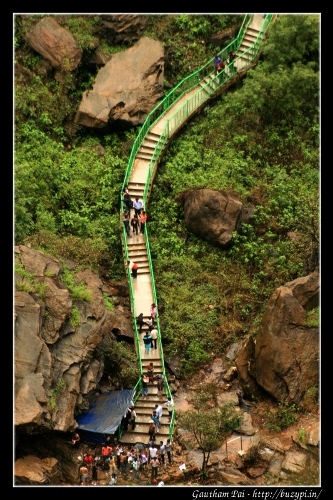 We took an internal route from Ikkeri to Varadahalli. This route has one stretch (of about 50-100m) where the roads are really bad and is a bit difficult to drive in vehicles with low clearing. Other than that, the roads are good and we reached Varadahalli at around 7:40pm. The temple is on a hill top and there are a couple of hundred steps to climb. We visited the temple, offered prayers and then headed back to Sagar via the better route. During dinner, we met a person who was from a small village called Sampaje near Sullia. 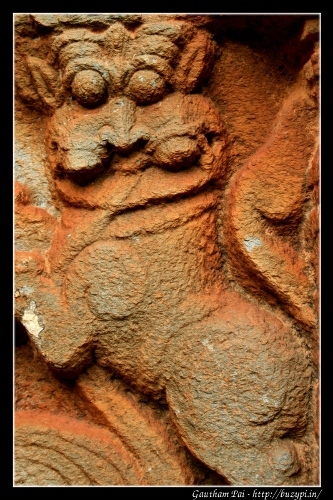 As we spoke to him, he mentioned Varadahalli (third time someone mentioned it independtly to us, is this a co-incidence?!) and when we told him we had already been there, he asked if we had visited the cave further to the top from the temple. We had missed it as it had already been dark when we visited. The weather was pleasant throughout the trip, it drizzled once in a while, but other than that, we did not have any heavy rain until our way back, when it started raining heavily near Tumkur.